The Center for Applied Technology and the Criminal Justice Crime Scene Investigation Facility are showing great strides in construction! Check out photos of their progress here. 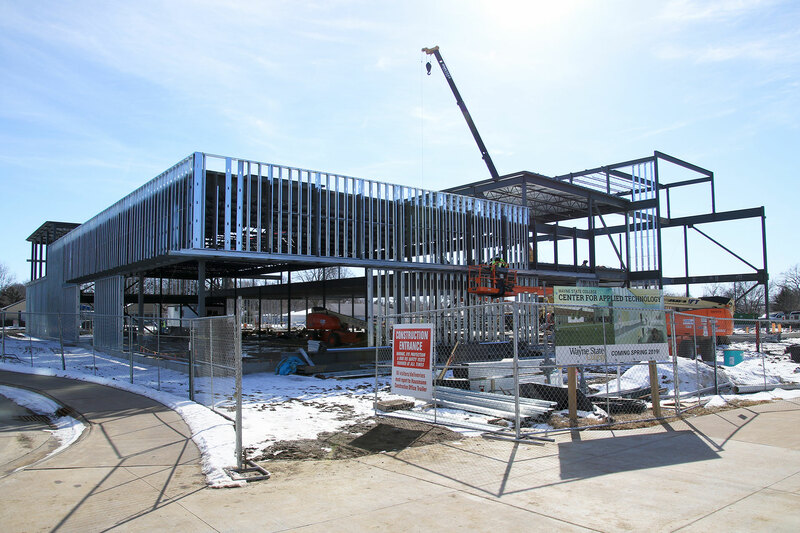 The steel framework of Wayne State’s new Center for Applied Technology provides a great look at the size of the college’s newest facility. The $15.2-million facility is east of Gardner Hall and is scheduled to open on campus in 2019. Wayne State offers Nebraska’s only industrial technology education degree in which teachers can earn certification in this field. The Center for Applied Technology will serve as a gateway of opportunity for students to experience industrial manufacturing in an environment that cultivates interest and excitement in industrial technology. Complemented by top-notch faculty who deliver an industry-based curriculum, this center will attract students from high schools and community colleges to seek careers in this growing area. Construction and site preparation for the new facility began in May 2017, with completion set for December 2018. The new Criminal Justice Crime Scene Investigation Facility, located just south of the Willow Bowl and Berry Hall, will provide a practical training site to augment classroom instruction for the criminal justice program at WSC. Future criminal justice professionals can learn how to enter a structure that may have a crime occurring, and it will provide a site for students to conduct a crime scene investigation by collecting, documenting, and processing criminal evidence.